A lot of things have happened lately. Bad things. Life-changing things. Some of those things I’ve shared privately on Facebook. One of those things I will share on here. But there are some things which I can’t share, not even here on my blog. Not even with my best friend, because he went AWOL on me a few months ago. That’s possibly the thing that upsets me the most, out of everything. Missing my best friend. But despite everything, I am trying to keep my head above water. I recently came out the other side of a dark depression which began last September and I’m so happy that I feel like myself again. Confident and ready to take on the world. I want to go back to being that strong, happy woman that some people considered inspiring a year ago. It’s difficult when life slaps you round the face as often as it does for my little family. I like to think I’m a good, honest, kind person and I’m trying to be more so. Some lessons I recently learnt about empathy, resisting arguments and being less judgemental have changed the way I think about everything. So has the Embrace Happy ethos of coming up with three good things about every day, especially the bad days. These things have made me a better, stronger and more positive person, because I see everything differently now. And I’m happier as a result. I’m coping with all the nightmares we are going through as a family right now. I’m coping and I’m taking one day at a time, I’m trying to stay positive and appreciate the beauty in as many things as I can. So now I’m ready to share one of those nightmares with you. 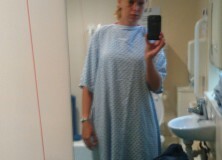 That’s where the lump is. I have all the symptoms too. I don’t need to give any more explanation than that. My doctor had a feel. She did the doctor thing of “it might not be anything to worry about BUT…”, Which in my experience just means she doesn’t want to be honest in case I break down in front of her. She’s referred me to the breast clinic. This comes only a few weeks after I watched “The C-word” on tv. I shouldn’t have watched it. It’s put a lot of fear into me. Yet at the same time, when you’ve had two different cancers in the past, there’s nothing worse than hearing blase comments from friends of “it’s probably nothing”. If the doctor doesn’t know yet, they sure don’t. I’d rather prepare to take on the worst and be elated if it’s not, than go in unprepared thinking it’s nothing. There you have it… One of the many things I’m going through right now. By trying to stay positive. Find three good things in every day. Being a mum is EVERYTHING. The lump turned out to be a harmless cyst, but I was told I was right to go in and be checked and it is always better to be safe than sorry. Now I can get on with dealing with the rest of our issues, one day at a time. 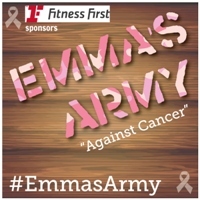 This entry was posted in #EmmasArmy, Cancer, Charity / Awareness, Health, Life, Medical, Mental health, Radioactive mum and tagged Cancer, difficult times, embrace happy, finding a lump, karma, lump on breast, optimism, Positive thinking, positivity, Raising awareness, three good things. Bookmark the permalink.